Since 2006 when my dad who spoke for global warming issued died, I chose to carry his torch. 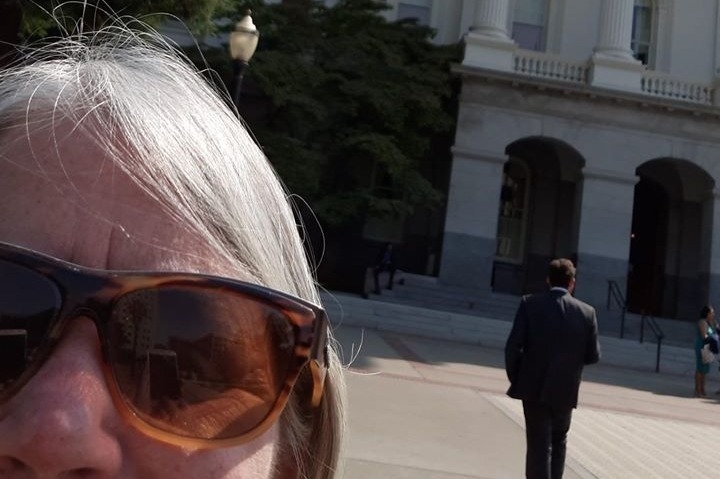 I have worked for successful campaigns since (getting climate leaders into Congress, the White House and the governorship of CA), and chose to start my own. I worked with science savvy students at local high schools over 4 years (2011-15) and we created tog our BeTheExample Contest, now launched successfully here in our county as of 2017. We want to take a new initiative called Eagle Rising out of state, to get Renewable Power legislation in more states than the 7 that currently have Community Choice Energy (aka CCAs). As of May 2018, we initiated Climate Team hubs in the first 2 state capitals to move this legislation, state by state, going to Augusta ME and Hartfort CT.
We have a goal for 5 more state capitals by the end of 2018: NV, PA, FL, TX and NM (Nevada, Pennsylvania, Florida, Texas and New Mexico). We believe this kind of grassroot-building will move Renewable Power state by state through an active legislative effort. We already have 7 states with this legislation: we look to double that potential this year. See www.LeanEnergyUS.org for details on the current 7 states. The funds will help us travel to each of these state capitals to spend two days to connect with the public at Farmer's markets or in front of libraries, to build a Climate Team hub in that state capital. The funding is needed to plan the next 5 months: starting in July in Nevada and Pennsylvania in Sept, with our final trips to the South in October, when the weather cools down there. This is our non-profit, Transition Express Inc, and we are the key players of it, working at a bare bones level. Our own funding does not allow us to cover these travel costs. Besides, we want to have others support this effort to make sure Renewable Power gets mainstreamed across the US. We ask you to support our effort! AT LAST! We had one final hurdle to deal with a glitch for moving donations - now resolved. We head to Harrisburg PA on SEPT 5 so welcome your support as we get to the last 4 states for our yearly goal of 7 capitals. We like this being a grassroots effort on many levels - including financial. TAKEN THIS WEEK at the state capitol in Sacramento CA. We dropped off a packet to Gov Jerry Brown's office, related to his upcoming Global Climate Action Summit, in SF. He is bringing governors (their equivalents) and mayors from all over the world. Just finalized our connection to our bank: we should be live now. I will confirm that asap! Need to get active on this campaign to get us Harrisburg PA in Sept, then Austin TX, Santa Fe NM and Denver CO in October. Getting traction on all this with our current hubs in ME, CT and NV! We have been to our 3rd state capital: Carson City Nevada, building a hub there, and 2 more in nearby cities: NW Reno and Incline Village. We invite all interested in our campaign to see our main website - www.TransitionExpress.vpweb.com and its sister website - www.BeTheExample.vpweb.com. Looking to have you join our grassroots team with your financial support! Next stop: Harrisburg PA in early Sept.